With all the knock out, fleurshrubselekt® and every other patented type of rose its reassuring that this old gal still rocks them all. Betty bears clusters of slightly fragrant large single pink flowers. They are light pink w/ a slightly darker sheen to the surface of the petals which almost always open skyward. These upright facing groups of flowers yield not only a lot of color- it blooms constantly from May to frost, it gives the plant a wild appeal not seen in overly bred shrubs. The disease resistant foliage is mid green and handsome as well. To 4′ x 4′ forming a rounded shrub. It may be hard pruned in early spring if necessary. Remove spent flowers and more will quickly appear. Tough plant that gets by on a less than perfect watering regime. Regular, deep watering (once a week max) will yield great performance. Established plants can take drought at the expense of re-blooming. Very easy to grow charming rose. Ultra cold hardy. Curious climbing rose that puts on a non-stop display of sprays of intensely fragrant flowers that are diminuitive, white, and semi-double. The anise/fruit scented flowers begin in mid-spring and continue unabated until autumn. A large growing rose to 12′ tall and 8′ wide in time. Excellent trained on a trellis or pergola. Blooms on wood from the current season and may be hard pruned in early spring. 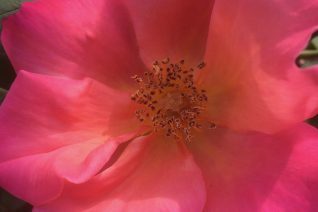 This rose seedling was discovered in a garden in Eugene and its popularity has spread throughout the globe. The sweet fragrance will perfume an entire garden on a warm summer day. Captivating cut flower. 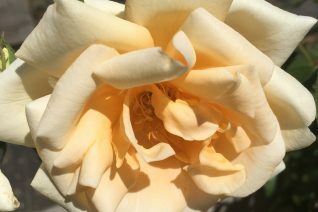 Disease resistant and very tough rose that gets by on a minimum amount of summer water and still blooms. Regular water in rich soil amplifies this roses performance dramatically. Winter deciduous. Extremely cold hardy. Everyone needs at least one fluffy rose in their garden and this one deserves a place. A true tea rose introduced in 1910 it is also very cold hardy for this class. Very double flowers emerge orange sherbet and age from the outside in to a soft pastel apricot- as per this class the petals are heavily scrolled. 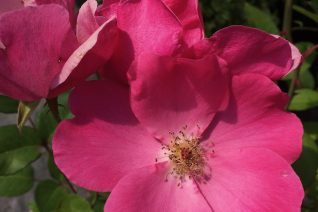 The nodding blossoms (a hallmark of a true tea rose) are somewhat loose with the powerful fragrance of dried black tea. Sweet and inviting. 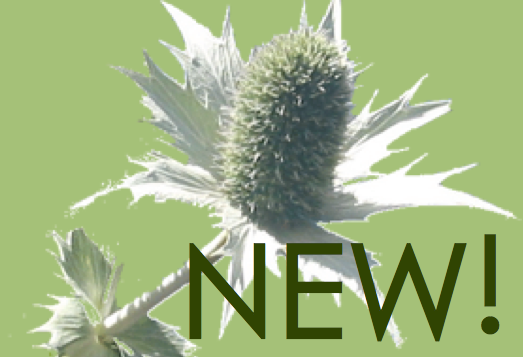 New foliage is maroon and transitions to deep glossy green. This is a wonderful backdrop to the ‘egg yolk’ colored flowers that virtually glow. Do not hard prune. Instead limit pruning to removing spent wood and the previous years spent blossoms. Blooms repeatedly from June to September- removing spent flowers encourages more. Full sun to part shade in rich, well drained soil with regular summer water for best bloom. Roses are heavy feeders and this one is no different. Begin its life with a large amendment of organic fertilizer to ensure a large and vigorous root system. Top dress with Alfalfa Meal in March. To 5′ on average and about 1/2 as wide. For diligent gardeners it may be trained as a climber. Joke: This rose was often grown against warm walls in colder climates. Hence, the phrase: ‘Lady Hillingdon’ she’s bad in a bed but great against a wall. HARR! Thank you Marcella Garcia-Moore for this excellent rose. Available Spring 2019. Blood thorn rose. 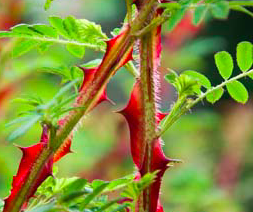 Justifiably famous for the sanguine glowing red hue of the thorns on new growth. Back lit by the sun it would make a vampire very very hungry. 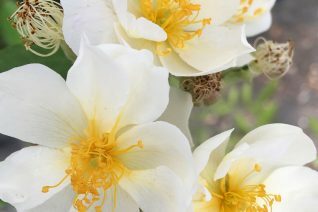 Large growing species rose that also features 1″ fragrant single white flowers en masse on wood from the previous season. Established plants (1-2 years in the ground) may be coppiced in early spring to emphasize and create new wood clad in thorns. If allowed to mature a year or two the thorns fade to gray but then you are rewarded with scintillating flowers in May/June. Full sun and virtually any soil, including heavy clay. But avoid standing water in winter. Average, regular irrigation in summer keeps it looking fresh. Old specimens can make do with little water. If you do coppice this plant for thorns make sure you follow up with a bit of fertilizer (a handful of all organic fertilizer 9.3.4) and regular water to ensure regrowth is robust. Winter deciduous- fall color is orange red and brief. Bright red, shiny hips follow a profuse blooming season. Long lived. To 8′ x 8′ if left unpruned. Regrowth on hard pruned shrubs in a season can be almost as big. Disease resistant, virus free and produced on its own roots. Light deer resistance. Nothing says I love you like a single red rose and this single red rose is perfect. Large 4″ single deep red flowers with a hint of magenta appear continuously from May to frost. 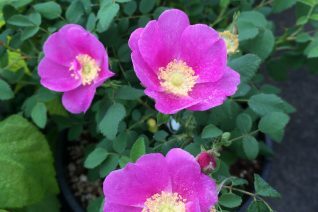 Easy, disease free rose with dark foliage that cups the intensely hued flowers. To 6′ x 6′ in a season. May be pruned in early spring to resize, increase density and blooming wood. Rapid rebloom all season. Great landscape rose. Very nice as a component in a border. Simple and clean and colorful. Full sun to light shade in rich, moisture retentive soil. Consistent summer water yields the best bloom but when established this tough rose can sail through a summer with very little water. Mostly deciduous. This, as all of our roses, is produced on its own roots. The invaluable red or purple leaved rose. Beautiful foliage has hints of blue and with the single pink flowers in May/June its sublime. These are followed by clusters of showy orange hips. To 7′ x 7′ very quickly in full sun and well drained soil of average to rich fertility. Avoid standing water in winter. 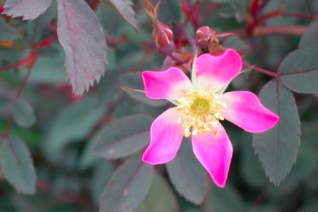 Very drought tolerant and easy to grow rose with a minimum of thorns. Large arching habit makes it a natural summer scaffold for smaller Clematis. Long lived, cold hardy. Orange fall color. Silently living its beautiful life in a seasonally flooded ditch near our wholesale nursery we spotted this deep pink flowering variant of our locally native Nootka rose. Even the stems carry a mahogany blush. 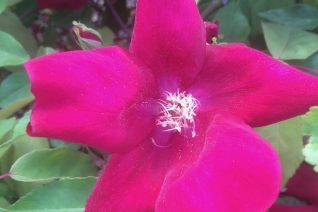 Incredibly fragrant deep pink single flowers appear from May-July. followed by brilliant red hips that ripen in fall. 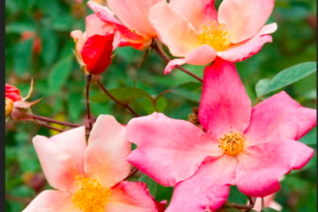 An incredibly tough and adaptable native rose that can endure both seasonally flooded locations and desiccating summer drought. Even the foliage has a sweet fragrance. Carefree shrub that spreads to form colonies and rises to about 4′ tall on average. Laughs at the heaviest, driest clay soils. Red/orange fall color. Oregon native plant.